WDCB is licensed as a non-profit/non-commercial public radio station. We rely on listener support and corporate donations for a large portion of our revenue. Skip the details above, and go directly to our online pledge page where you can make a contribution. If you prefer to speak with a person, please call WDCB during business hours at (630) 942-4200. We'll happily help you with the donation process. Learn the details of WDCB's Employer Matching Gift program. Have questions about donating to WDCB? Learn the details of WDCB's Listener Support program. Businesses benefit from an association with WDCB. We have many types of opportunities, something for everyone. Please consider including WDCB in your Estate Plans. We take care of all the details, from pick-up to paperwork! 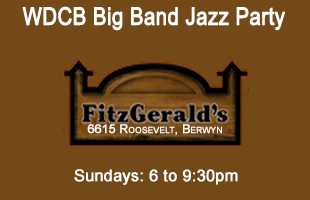 WDCB is additionally supported by a grant from the Corporation for Public Broadcasting, and the Illinois Arts Council through its administration of the Illinois Public Broadcasting Grant.